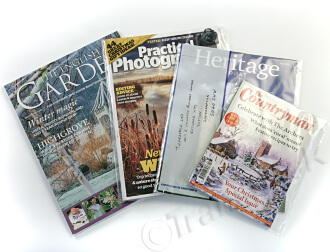 Clear mailing bags in paper sizes for brochures, leaflets, newspapers, magazines etc - A5, A4 and A3 sizes available. Our clear mailing bags have self seal flaps for easy sealing, and are waterproof and lightweight. All are recyclable and we now offer a biodegradable version too. Also available with a write on panel for easy addressing.